Suddenly, after rebooting a Snow Leopard Mac Pro (2009), I cannot copy to the main disk, or even move one of its files, without having Mac OS X asking for authentication. I'm talking about copying a file from the Desktop to somewhere else on the same disk, the one the system has booted on...! 2 x Mac Pro 2009, one has Mac OS X 10.6 Snow Leopard working properly, the second one has nothing. I used Copy Carbon Cloner to make a clone of the first Mac on another disk then installed the copy in the second machine. It worked for some time! Then, on this second Mac, I added another disk in bay 3 and things started to go south. I think the disk in bay 3 was faulty. So I stopped the machine, removed the faulty disk from bay 3, and rebooted. And here the authentication problem on the main disk appeared. I've booted from another system partition on another disk then used Disk Utility to repair the disk and to repair permissions. No errors were detected. I researched other answers to similar questions but they are all about using an NTFS disk, and this is not my case at all, I'm talking about a standard HFS+ Mac OS X disk that suddenly is in this "read only" mode. If I add another disk with Yosemite installed, I can boot on it and I can copy/move/write anything on the Yosemite disk and on the Snow Leopard one. But I absolutely need to have the Snow Leopard one also working (because of obsolete apps we still need) and rebooting again on it, the problem is still here. In a 2009 Mac Pro, a cloned Snow Leopard disk asks for authentication for any file operation. 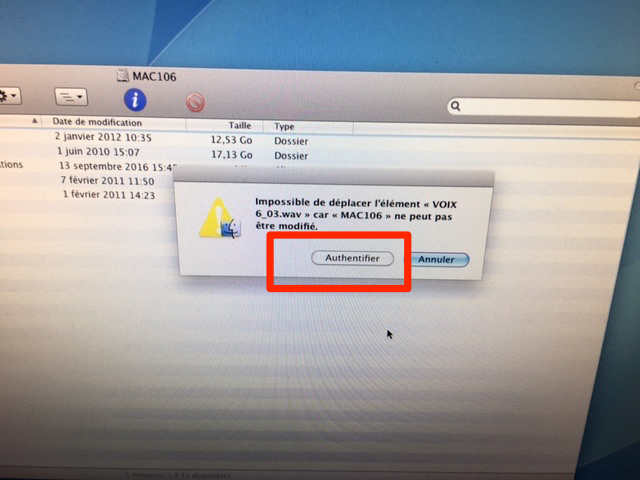 In the same Mac Pro, a Yosemite disk works properly and does not suffer from this issue, I can move files on the Yosemite disk and on the Snow Leopard disk. Back on the Snow leopard one: the authentication problem is still here, for all disks in the machine. drwxr-xr-x@ 15 lollipopmusic  staff    510 17 oct 16:40 .
drwxr-xr-x@  6 root           admin    204  1 fév  2011 ..
drwxrwxr-x@ 30 root           wheel         1088 17 oct 16:43 .
drwxrwxr-x@ 30 root           wheel         1088 17 oct 16:43 ..
drwx------@  30 lollipopmusic  staff      1020 17 oct 16:43 .
drwxr-xr-x@  15 lollipopmusic  staff       510 17 oct 16:40 ..
Click the padlock, type your credentials, click the "Read Only" tag next to your username, click on "Read & Write", click on the padlock, and done. Before you do this, always make sure you have a recent backup! Is your problem only at the root level, or in every folder? If it’s in every folder try this solution, it’ll remake all file permissions: launch the Terminal from /Applications/Utilities/, type this command: sudo chmod -RN ~/Desktop, press enter, type your password, and press enter again. Wait for the command to finish (it can take some time). If this makes you able use your desktop as Read/Write, you can try doing this sudo chmod -RN /, it’ll do the same but for the whole disk instead. Not the answer you're looking for? Browse other questions tagged macos hard-drive disk-utility snow-leopard mac-pro . Move disk to new hardware?